Shipping a small parcel abroad is enough to cause me to have a headache so sending massive steel structures, like aircraft hangars and bridges from a small town in Dorset to 130 countries worldwide must surely be enough to cause the mother of all migraines. 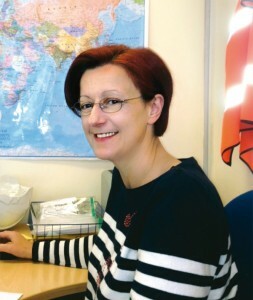 To find out just how difficult a job this is I had a chat with Ana Monti, REIDsteel’s Despatch and Shipping Manager. In the five years that Ana’s been with the company she has shipped hundreds of hangars, bridges, office buildings and warehouses to places as far flung as Mongolia, Nepal and the Falkland Islands. Ana maintains (although I’m not sure I believe her) that it’s not particularly difficult to organise the shipping, as long as you don’t mind filling in reams of paperwork, but there can be unexpected pitfalls. Two of the main problems in recent years have been the slow-down in the economy and the fluctuating cost of fuel. The economic situation has meant quite a few shipping companies have gone out of business. Of those that remain, rather than put the price up to customers some control their fuel costs by getting the ships to go at half their normal speed. While it’s good that costs don’t skyrocket, it’s far from ideal to discover that a shipment that was due to arrive in, let’s say, July actually arrives in September. Thankfully, because Reid’s has been shipping its products around the world for almost a century, they are well used to making contingencies and Ana says it’s rare that this ‘go slow’ causes major problems for customers. Festivals, such as Eid for example, mean some ports close down completely, so knowing what’s coming up when planning a shipment is essential to her delivery scheduling. Now that’s not something you’d see on everyone’s CV.